Was flicking through the pages of "Le Automobili Alfa" (the magazine of AROCA SA Div.) 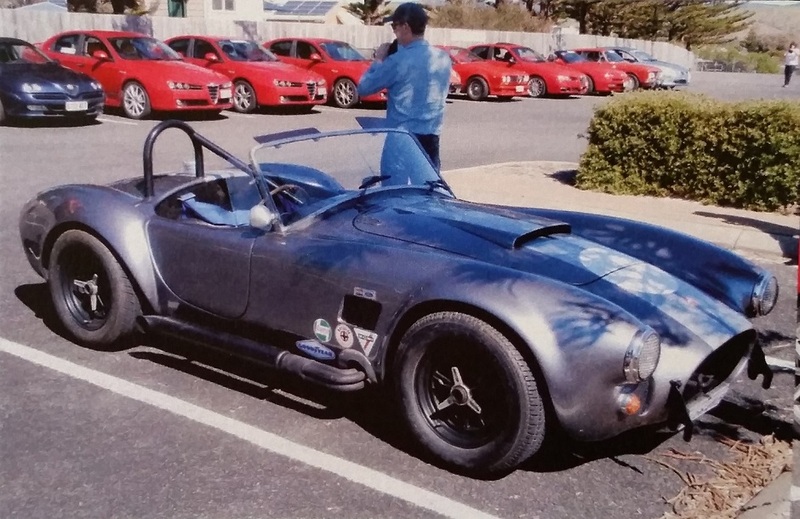 and I found the following picture....a Cobra replica backed by ten Alfas. The page heading was for the Targa Fleurieu, so I'm assuming the location was somewhere on the Fleurieu Peninsula, South of Adelaide in South Australia. It's not one I recognise, so....anybody....any information....? You knew Glen, I'd have to say something Too Cool ! My 2-favorite kinds of cars in one photo, doesn't get much better then that. Thank you buddy. Cheers Tom. Last edited by xb-60; 11-06-2018 at 09:12 PM.. I just knew you would come up with something like that Jim Thanks Buddy And yes, I was passed by a few Cobras on the track, over the years, most of the time I had enough time to pointed them by, before they BLASTED by. The neatest pass by a Cobra was: Tom Benjamin (Real 289FIA) and Wade Carter (Porsche 906) off turn 9 at Pacific Raceways, they went by while racing side by side, for the lead, and split around me I was a moving chicane a 140mph rocked the poor ol'Alfa. The sound was off the charts. Cheers Tom. xb-60 and 1795 like this. Last edited by xb-60; 11-07-2018 at 05:49 PM..
Tha'ts the look I love in a Cobra - Like it's been on a fast trip on all types of roads and not all polished up and unused. Like the stickers low down just behind the front wheel as well. And with Alfas too - thanks for posting that.